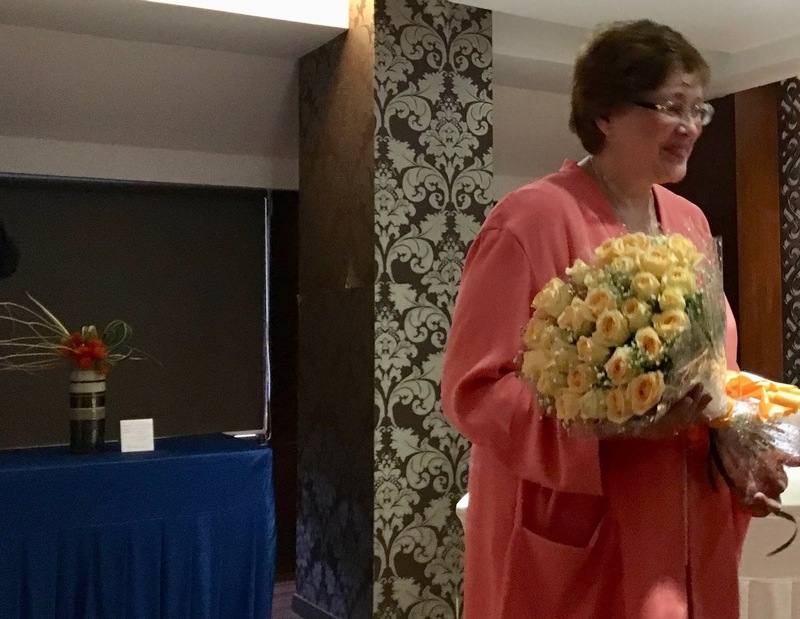 Mr Kojiro Uchiyama, welcomed with flowers of course! The Study Group gathered again after the summer break, and what a nice way to kickstart our activities again! We had the pleasure of a visit by the new Consul General of Japan and his wife, Mr Kojiro and Mrs Karen Uchiyama, accompanied by Ms Megumi Shimada, Consul for Cultural Affairs and Information, whom we all know as a well-wisher and friend of the Sogetsu Study Group. 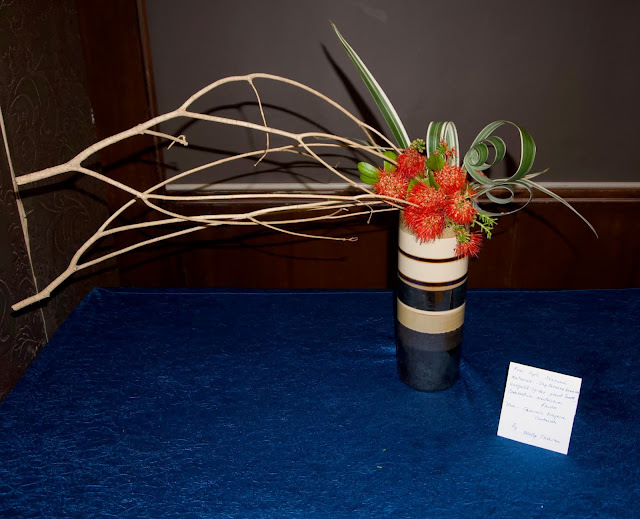 This tea meeting was held at The Savera, a city hotel, who were helpful and accommodating of our needs for buckets, water and other odds and ends that are unique to Ikebana needs! 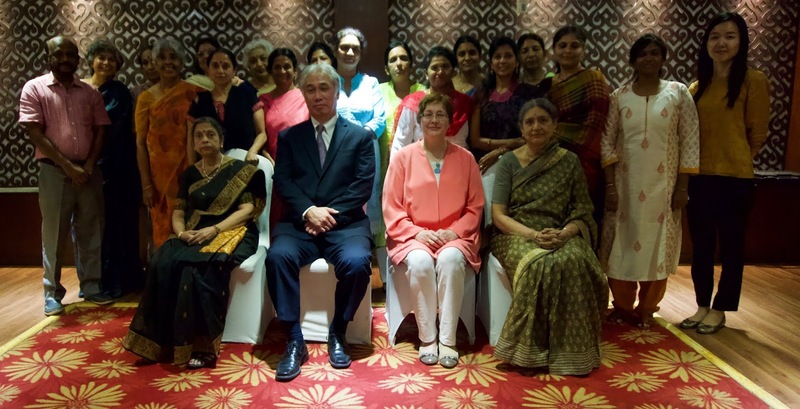 Mr and Mrs Uchiyama are no strangers to India, having served at the embassy in New Delhi several years ago. In fact, they were familiar with our Sogetsu friends from New Delhi, and spoke fondly of the flower friendships and cooperation during their stay there. The meeting was well attended, with 17 of our members joining in. Our Chairperson Mrs Malathi Pandurang introduced the guests to the Group, and in turn, also introduced our Group and our activities to the guests. 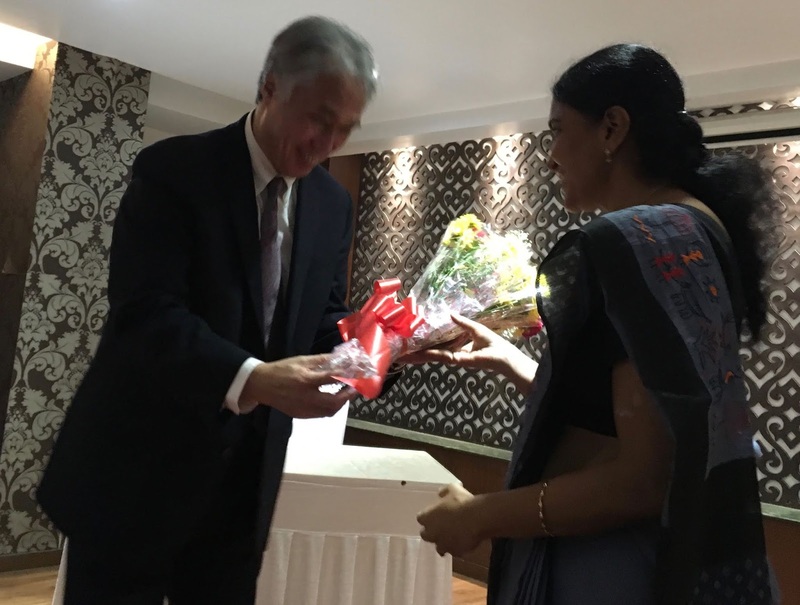 Mr and Mrs Uchiyama gave us their remarks and we were immediately touched by their warmth and openness, as they shared their personal experiences of India and Ikebana with us. 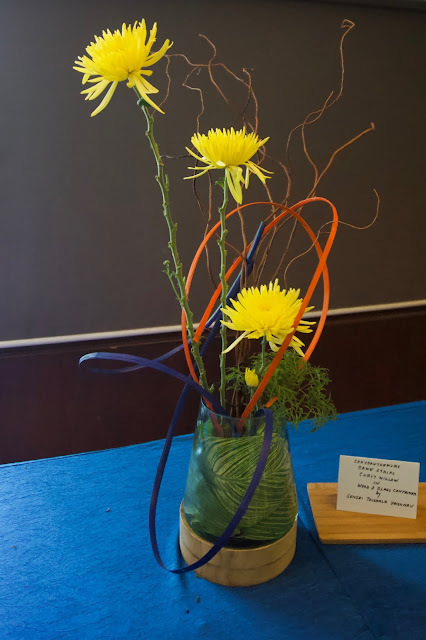 They took time enjoying the Ikebana compositions put up by the Senseis, and also enjoyed dialogues with members over some hot tea and delicious bondas! 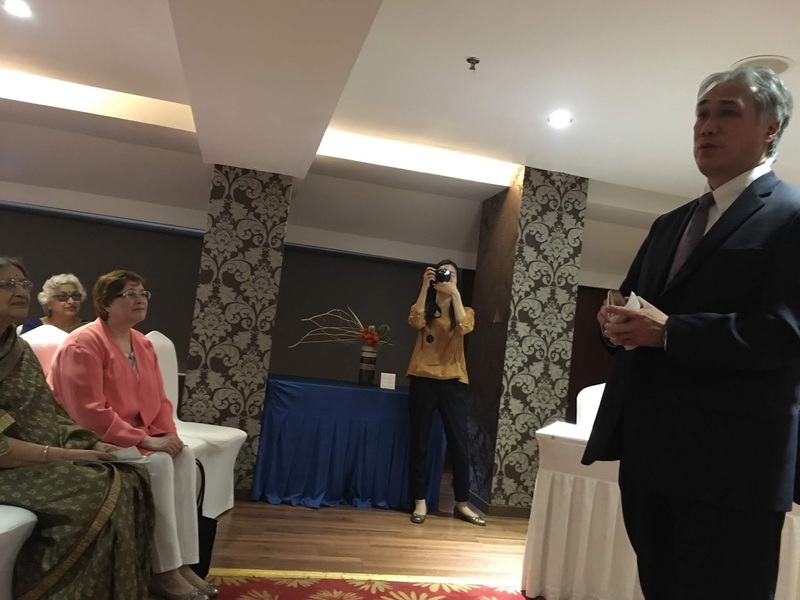 We do look forward to many more such interactions, and of course working closely with the Consulate in the years to come. 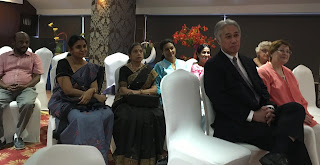 Our members assembled for our meeting, which preceded the tea reception with the chief guests. The Senseis put up their freestyle compositions and then we got down to the business agenda. 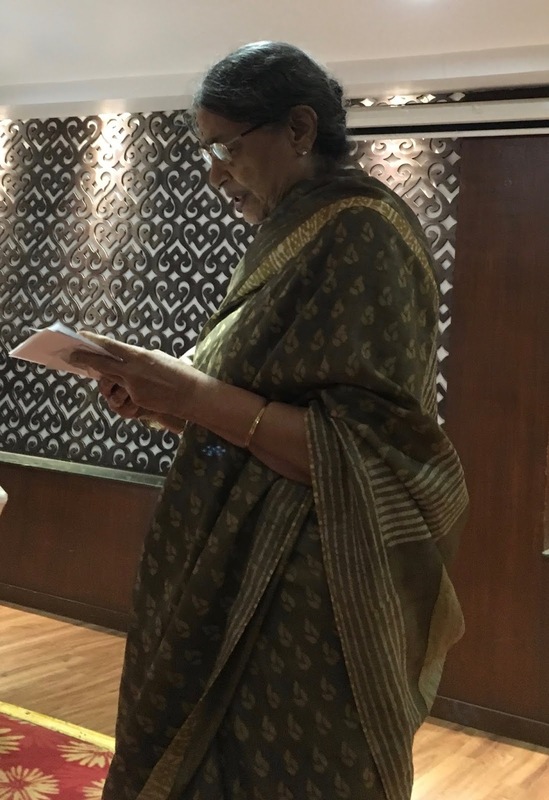 The report of activities of the previous year were summed up by Ambika while Janaki presented the accounts. She formally handed over the treasurership to Chelvi. Programmes Secretary position was formally handed over by Divya to Bhuvana. The Group was unanimous in wishing the new committee good luck and in thanking the previous office bearers for a job well done. drew a lot of comments! 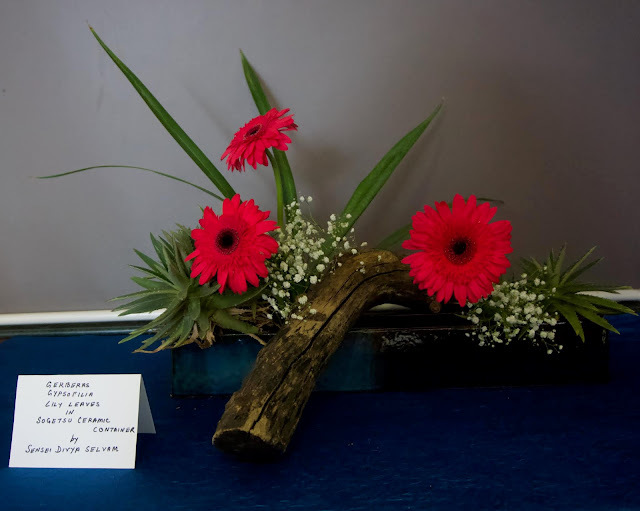 Sensei Divya highlighted the driftwood line in this composition with Jerberas, Gyposphila and lily leaves. Mrs Uchiyama appreciated the driftwood. Prerana sensei created some magic with lights from within a cane ball placed on a fibreglass moribana container. 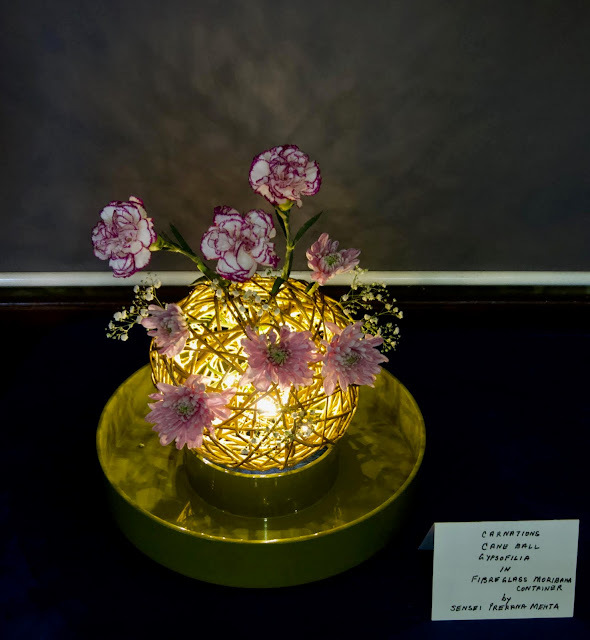 They provided soft backlights for the carnations and chrysanthemums. 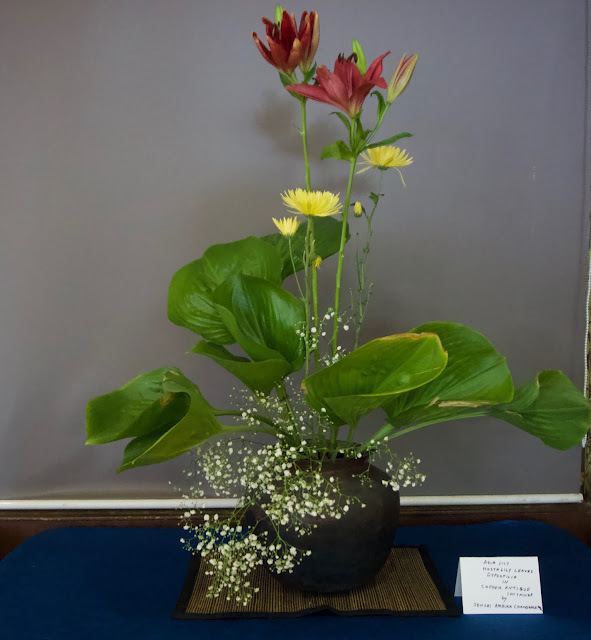 Hosta lily leaves and Gypsophila, swirling around the upright Asia lilies and chrysanthemums. and Mr Uchiyama enjoyed the restrained simplicity of the composition. for health reasons. 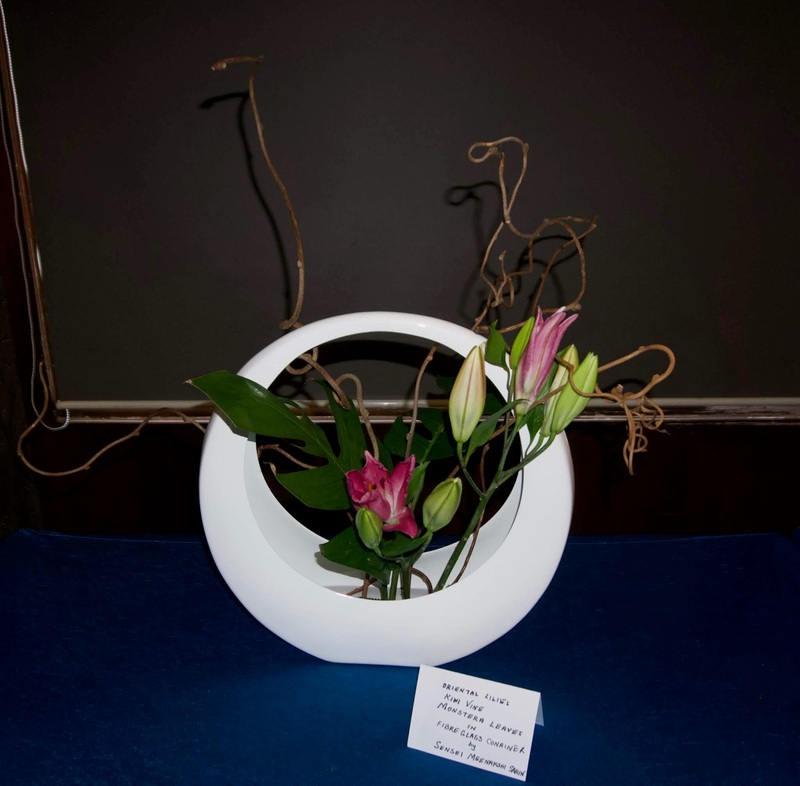 She used lilies and vine in this fibre glass basket. delighted everyone! 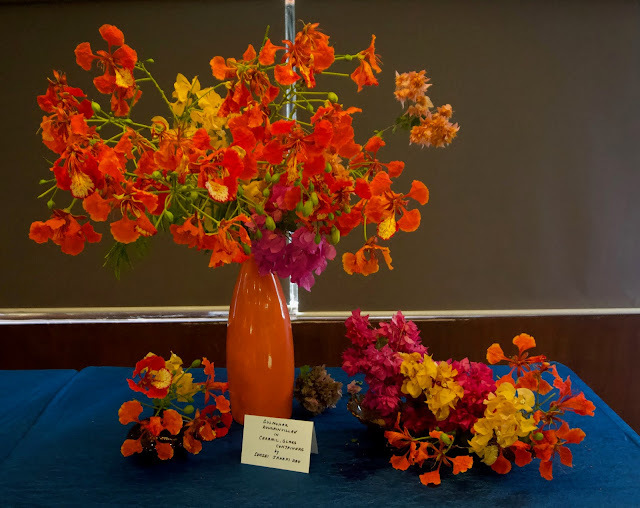 She combined Gulmohar with two colours of bougainvillea in a ceramic vase. willow, with the chrysanthemums adding a colour focus. 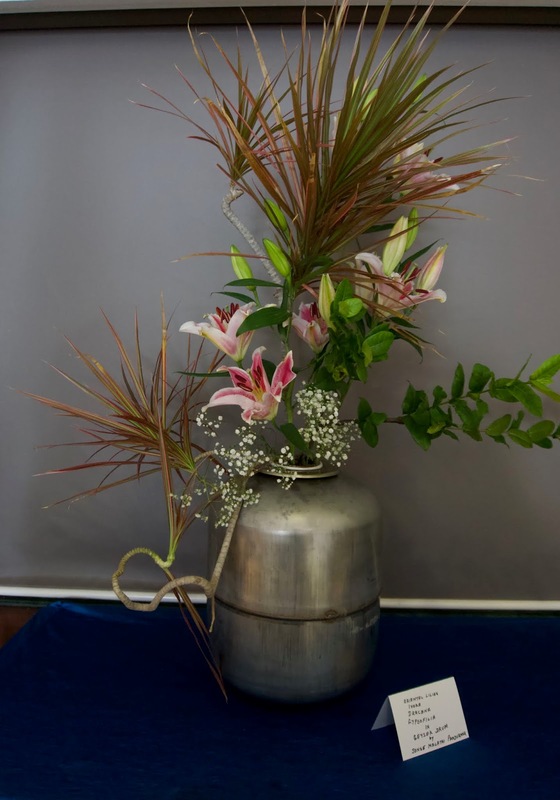 Each composition was unique and different, and what a wonderful way for us to restart activities for the year! We were hoping that Mr Ranganathan of ABK AOTS Dosokai would also be able to participate, but he was held up with family commitments, and sent us his best wishes. Our August workshop has been fixed for 18th of this month at ABK Sakura Hall at 11 AM. Sensei Meenakshi Sarin will be doing the demonstration and followed by the workshop by all members. 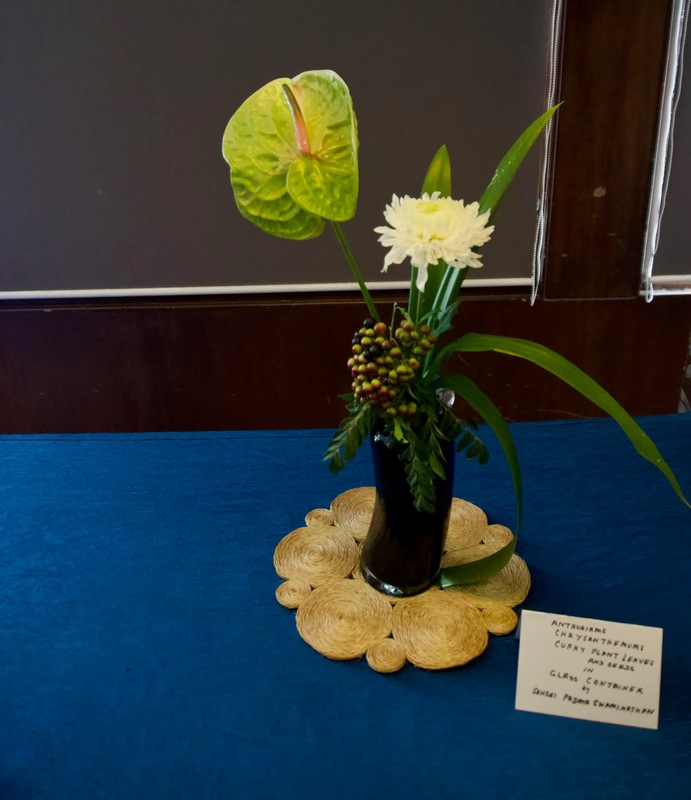 The theme for the demo and workshop is "Hope in Adversity".